So, since I was back-to-school cloths shopping for the little ones ALL DAY LONG this is a late night post...but hopefully it will get to those who will find it informative. I'm not sure if most schools require children to have so many pairs of shoes, but my kids' school require kids to have a pair of gym shoes, inside shoes and outside/recess shoes (or boots in the winter). The gym shoes MUST have non-marking soles. So, on my quest to find shoes with non-marking soles, I found that A.) Not all shoes say "non-marking sole"- even if they have a non-marking sole, and B.) these stickers that were on nearly all the shoes I looked at. 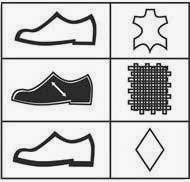 The top picture on the left with the arrow pointing to the upper of the shoe is telling you what the upper is made of, in this shoe's case coated leather (the first symbol), and "other materials" (the white diamond). The second picture on the left hand side of the sticker is showing what the lining and sock is made of. In this shoe, the lining and sock is made of textile, or fabrics. 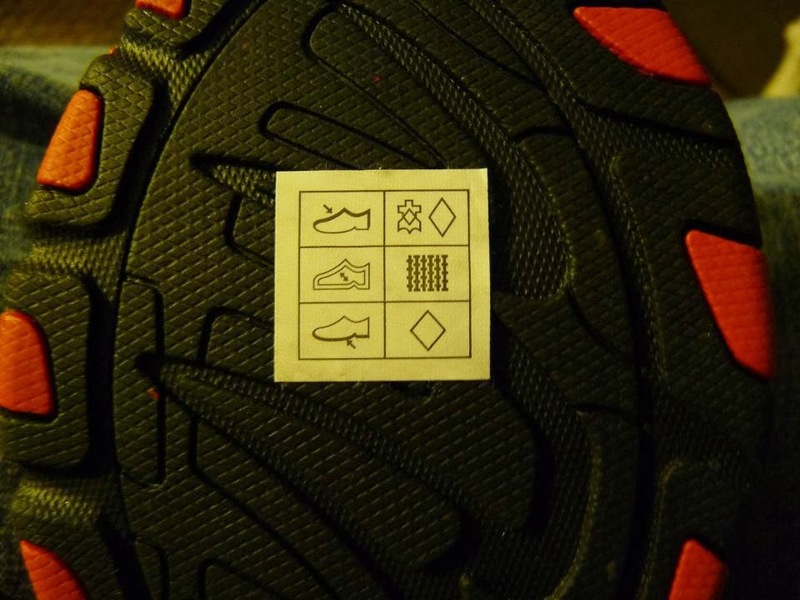 The third picture on the left with the arrow pointing to the sole is for the outer sole. The white diamond means the same as in the top right hand diamond... "other materials". Sooo.... why the info? Well, people like to know what they are getting, and some people really need to know this info. Vegans can use this information to help them purchase shoes that do not harm animals. The textile picture and white diamond both represent materials that are Vegan Friendly (contain no animal parts, such as leather). Leather: This is the hide or skin from an animal that has been put through a process called tanning. There are many types of leather and that is an educational page all in itself. Coated Leather: This is one of the processes of treating leather; basically the leather is coated with one of a variety of products for the desired look. Textile: This means fabric, the list is endless. This is one of the symbols the vegans, vegetarians and eco-friendly consumers look for because it means all natural or man made materials are used for the construction. Other Materials: This is still man-made materials just a little different because these materials usually refer to the sole of the shoe. The most common of these materials are Thermoplastic Rubber, PVC, Rubber Compounds, Crepe, and Composition. All of these materials are friendly for the Vegan, Vegetarian and Eco-Friendly consumer. In other news... the shoe that was in question (in the above picture)-Sketchers Grenadier- has a non-marking sole according to the Sketchers' website. They could just put a slip of paper in the shoe to tell you all of that stuff!! Maybe the paper would cost too much? Who knows...but I really don't see why they made a sticker to put on the shoe when no one knows what the sticker means. How strange! Thank goodness the Internet knows everything. i am in the shoe business, and found myself internet searching the meaning of those little stickers, thanks for the answer! Thank you so much for having these answers and posting the link where you found them. It's nice to know (finally!) what that sticker means!Again, thank you! Thanks for your research! Super helpful!